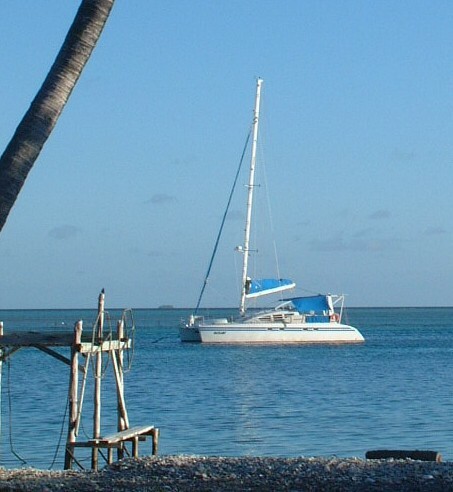 History: The history of all the Tuamotu Islands can be found on the Tuamotu map page. Read about diving in Toau! Also, check out the newsletter we sent out while we were in Toau! (Jon) Toau was one of my favorite atolls because it's one of the few places we've been where the locals were happy to have us share in their day-to-day lives. At Anse Amyot, at the northern end, is a small cul-de-sac of an anchorage (probably an old pass that's growing over with coral). Dinghies can get into the main lagoon, but only if they're very careful. The 3 families living there have put down several moorings for the yachts. They were extremely gracious, offering to let us go lobstering or fishing with them, showing us their island, sharing meals with us, and (most delightfully) sharing music and dancing with us. They weren't shy about visiting us on Ocelot, or asking for small stuff they needed (they're very isolated). They instantly treated us as friends, and made us feel welcome. Too often, those of us in the cruising community tend to stay on our boats, interacting more with each other than the people we're visiting. Sometimes that's because of language, but that's getting better now that all of us knows at least a little French and Spanish (and Sue, our teacher, is quite fluent in both). But somehow, language wasn't a problem on Toau, mainly because they wouldn't let it happen. Toau has a delightfully warm and special place in my memory. (Chris) There were two great things about Toau: the people in Anse Amyot and the diving. The southern pass, where we first entered the atoll, had some truly superb diving. Outside the pass, a very gentle current carried us along a sloping wall of coral. Large fish came right up to arms length and looked at us, while five foot reef sharks circled around. As we came to the pass, the incoming current pulled us up the wall of coral. The pass had a stronger current and less coral, but a group of sharks circled in one place, and we grabbed pieces of rock or dead coral to stay in place and watch. When we were through the pass, we surfaced and found our dinghies coming right to us. It was a really fine dive. Later, we did another dive outside Anse Amyot on a steep wall, and went down to a personal depth record of 90 feet. In Anse Amyot, we were warmly greeted by the (large and extended) local family. They provided a mooring (much easier than anchoring) and showed us some of the island. There were several boys within a few months of my age, and everybody was very friendly. Most of them spoke English, and I got to work on my French also. On our last night there, they held a potluck with lots of good food. The boys and men played guitar and ukulele (the Tahitian ukulele has eight strings, doubled like a mandolin) for us, and everybody danced. (Amanda) We pulled in to the entrance of Toau for a night or two, but that's not really the place where most cruisers hang out. It's more of an intermediate stage of getting from Fakarava to Anse Amyot, a little cove on the northern side of the island that doesn't actually connect to the inside of the atoll except for a little dinghy pass that only the family there seemed to know. Even then, you could only really go through during high tide. The family at Anse Amyot is so friendly, and they absolutely love including the cruisers that stop by in their daily trips to lobster, spearfish, snorkel, whatever. 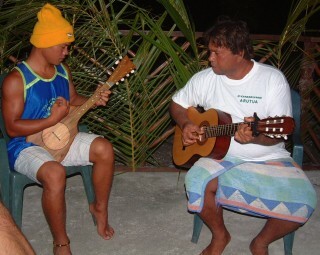 We had a very nice dinner there, as well, with two guitars and an authentic French Polynesian ukulele with eight doubled strings like a mandolin. 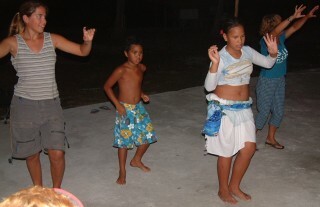 Violet, 12, was a good Tahitian dancer, so she danced for us, then the rest of us got up and danced... It was a fun night. 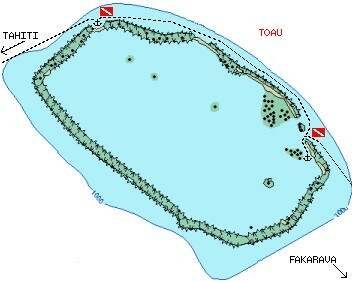 The family also has their own pearl farm, which is quite extensive throughout their side of the atoll. 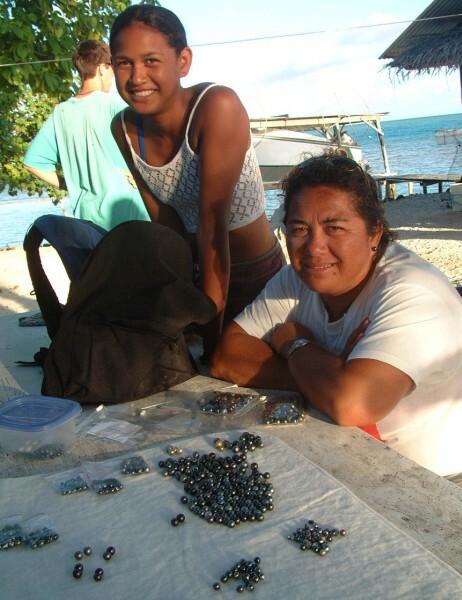 A lot of their pearls are sold in Tahiti, but they had some there, so we spent some fun time going through their black pearls, and their pearl books, and eventually ended up buying some of them. Before we left for Tahiti, Dad had Chris and I create charts with graphs to show when we should leave Toau if we were going a certain speed, to arrive during daylight. It was an interesting math challenge, and we all generally decided to leave that night, figuring we were going to go about 6 knots. Well, as we left under full main and jib and quarter moon, we were doing 9 knots, and soon it was to late to turn around. So we actually spent an extra night at sea that we didn't have to, which was all the more annoying because on that sail I got sick for the first time in a year and a half, and had a splitting headache as we pulled into Tahiti. (Sue) Getting to meet the families at Anse Amyot was a real treat: a glimpse into the lives of people who live such different lives than we do. Of the eight children in one family, 5 of them still attended school in Tahiti, and the mom went with them 6 times a year by runabout power boat to Fakarava atoll to get on the plane to Papeete, Tahiti where they attended school. The oldest two boys had finished their studies and had returned to little Toau atoll to help with the family business of copra collection (dried coconut), fishing, running the family restaurant, and the family pearl farm. We got to see a large selection of black pearls gathered by one of the other families. Each pearl oyster is washed and netted after it has been seeded, and then it's hung in the lagoon for up to two years while the single pearl grows. The color is determined by the choice of the small piece of mantle (like an internal skin) that is put in from another animal. 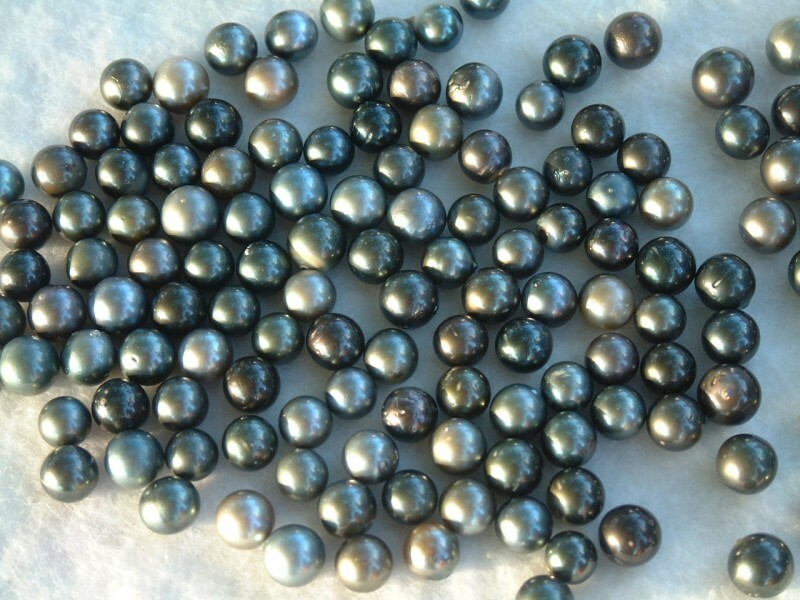 If an oyster makes a particularly perfect pearl, it is sometimes re-seeded with a larger seed pearl and left for another couple years to try and produce one of the really big pearls, about 10 to 12 mm (3/8" to 1/2").